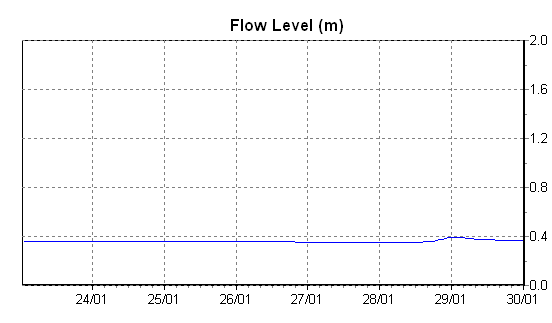 Information on the air temperature, water temperature and flow level is captured live at the river data monitoring site at Tarland Burn. The Tarland catchment has been the focus of water quality research at the James Hutton Institute for over 12 years. In response to policy driven requirements we aim to link hydrology, water quality and ecology in order to provide catchment scale demonstration sites where techniques in Natural Flood Management (NFM) can be evaluated through monitoring and modelling. The automated monitoring stations at Netherton, Tarland Village, Coull and Aboyne (all on the Tarland Burn) enable us to collect relevant empirical data which underpins our hydrological modelling work. Readings from the last 7 days and what do they mean? Air temperature is measured because it is a) the main factor governing water temperature and b) the sensor used to measure water depth requires this data. Water temperature is measured because it is a) an important factor governing life in aquatic communities and b) is essential parameter used to calibrate the electrical conductivity data. The water level provides an indication of the magnitude of the flow in-stream and can relatively easily be converted into discharge to enable the dissolved solids and load to be calculated.